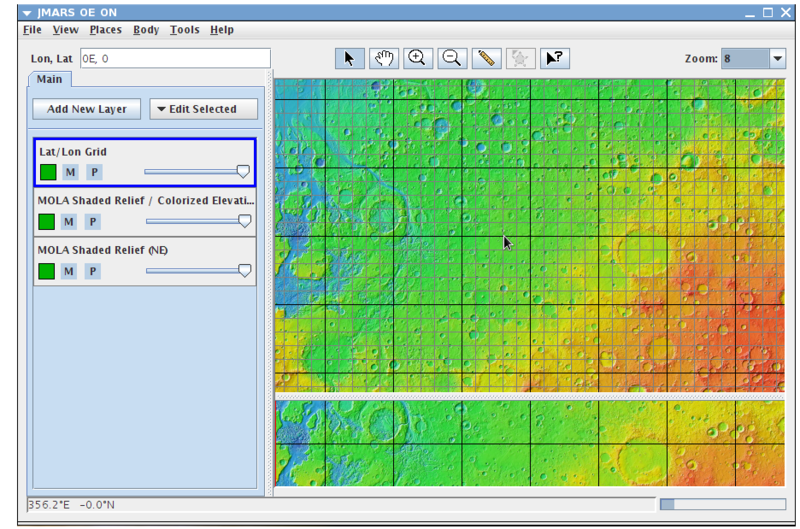 The Latitude/Longitude Grid Layer, which is available in all releases of JMARS, draws latitude and longitude lines in the Viewing Window and allows users to measure distances. Open the Lat/Lon Grid Layer: The Lat/Lon Grid is one of two default layers in JMARS that will open automatically whenever JMARS is started. If you need to re-open the Lat/Lon Grid Layer after closing it, go to the Layer Manager, choose "Add New Layer" -> "Lat/Lon Grid"
Edit the Default Grid Settings: To change any of the layer's default settings (ie: line spacing, line color, etc), double click on the "Lat/Lon Grid" tab in the Layer Manager to access the focus panel. Select Major Line Frequency: JMARS defaults to placing major latitude and longitude lines at 10 degree intervals, but this can be changed by editing the "Major Lines" box. Users can also chose whether or not the major lines are displayed in the Main and Panning Views by clicking the appropriate checkboxes. Select Major Line Color: The default color for the major lines is black, but it can be changed by clicking on the black color box and choosing a new color. Select Minor Line Frequency: JMARS defaults to placing minor latitude and longitude lines every 2 degrees, although it does not automatically display them in either the Main or Planning Views. Users can add the minor lines to either view by clicking on the appropriate display checkbox. Select Minor Line Color: The default color for the minor lines is gray, but it can be changed by clicking on the gray color box and choosing a new color.